I often used to see and hear these ‘shriekers’ in villages and monasteries. Taken to the Sunday liturgy, they would screech or bark like dogs so that the whole church could hear, but when the chalice was brought out, and they were led up to the chalice, the ‘demonic possession’ would immediately cease and the sick ones would always calm down for a time. As a child, I was greatly struck and astonished by this. The Brothers Karamazov, Book II, Chapter iii. The detached and naturalistic explanation offered by the doctors would hold up to the scrutiny of any detached and naturalistic observer, and their formulation of the placebo effect kindly acknowledges the reality of the disease. But were they to tell one of these women what was “really” happening, she would be dissatisfied, even offended – and worst of all, the faith that had been healing her would likely cease to do so. Their explanation establishes a gulf between themselves and the woman as an object of observation, robbing her of the subjectivity that makes her a human being. In attributing deceptive intent to her, the teachers left her human, but confined her to a perceived subclass of criminal peasants. Only the child-narrator, whatever his naïveties, preserved and respected her status as a fully human being, and their shared faith thus linked them as persons. And it did more; it transformed the mundanity of their lives into a microcosm of the Christian view of time and history, a mirror of the entire relationship between God and man, wherein the soul toiling in a vale of tears hears her redeemer’s beautiful promise, rises in trusting response, and finds herself transfigured on the ascent. In Dostoevsky’s presentation of three competing narratives about the miracle before the altar, we see that any hope we have of communicating with another person is dependent on our willingness to faithfully tell his or her story. Indeed, our stories, poems, songs, and folktales bring us together, giving us a sense that there is continuity and we fit into it. Our love for them, meanwhile, expresses our need for such an overarching meta-narrative. The Jews exiled in Babylon, for example, maintained hope by retelling the story of their early enslavement in Egypt and delivery into the land promised to them. History and poetry worked in concert to shape the captives’ expectations of a new deliverance. Behind it all was the trust that the God who had made all nations and chosen one for himself would not forget his promise. For some time, modern Western audiences have entertained different meta-narratives. Their origins are legion, but we may trace one persistent story, which many of them share, back to the dawn of the modern era. By the time of Shakespeare, Christendom’s fusion of Judean religion and Hellenic philosophy had long regarded man as a communal being made in the image of God and endowed with a rational faculty for exploring the created order, tempered by his own finitude. Man was free and made for good, but also fallen and tending toward evil. But things changed, and swiftly. For Hobbes and his followers, “life is a motion of limbs”; fundamentally, “every man is Enemy to every man,” as his Leviathan (1651) has it. In 1689, Locke’s Second Treatise proclaimed man in his natural state a tabula rasa, free of any innate principles—man enjoyed such a “State of perfect Freedom” that he may not even need to interact with anyone to do what he wills. Later, in The Social Contract, Rousseau would claim that man, in his quest for survival, had in his state of nature “an unlimited right to everything that tempts him and he can reach”. These philosophers shaped the period called the Enlightenment, and though they expressed a multitude of opinions, they by and large coincided in what Andreas Kinneging terms (in his essay collection The Geography of Good and Evil) their “misplaced optimism about human nature,” by which they thoroughly inverted the traditional Western conception of humanity. Ever since, we have presumed the source of evil, regardless of certain diagnostic disputes, “should not be sought in man but in society,” and that evils can be eliminated by a perfected social order. The new Man (or state) was to be boundless and devoted to increasing his unprecedented, albeit strictly scientific, dominance over nature. Blind to the equal dignity, and interrelation, of women, children, and servants, society applied this anthropology to the gentleman, and he trickled down to us as “the individual,” the purported basic unit of society to which all others must be conformed in order to be equal. the general laws, known or unknown, which regulate the phenomena of the universe, are regular and constant…why should this principle, applicable to the other operations of nature, be less true when applied to the development of the intellectual and moral faculties of man? Since there was no substantive difference between a man’s moral faculty and “the other operations of nature,” morality is reducible to physical motions, as Hobbes, too, seems to suggest. Natural science, the means for bringing creation into submission, could open to manipulation the causal forces that guided human life and culture just as clearly as it had revealed celestial orbits to Kepler and Galileo. The winding trajectory of Enlightenment thinking had, by the nineteenth century, popularized a deterministic faith in another trajectory, the inevitable scientific advancement which would solve each of humanity’s problems. This Gnostic narrative, teaching that scientific knowledge saves, is still with us today in our culture of expertise, in our political preferences for technical solutions over tradition and experience, and in our hope that modern medicine can do away with death (or at the very least the pain accompanying it). The same narrative was turning Russia upside down in the middle of the nineteenth century as Western-educated Russian intellectuals streamed to the countryside to reform their homeland. And it was this grand story that Fyodor Dostoevsky engaged with The Brothers Karamazov. The child’s, teachers’, and doctors’ successive explanations for the recovery of the women called “shriekers” prefigure the novel’s pattern of setting up human expectations in order to shatter them. Its subplots and scenes glow through the tinted glass of competing historical visions. Two of these are embodied by Ivan and Alyosha, brothers born of a woman afflicted by the shrieking disorder. Ivan Fyodorovich Karamazov is the novel’s primary mouthpiece for determinism. For Ivan and many other revolutionaries in Dostoevsky’s Russia, socialism was the logical end of human progress. Ivan’s essay “The Geological Cataclysm” exemplifies the progressive trope of human history envisioned as a developmental subcategory of our planet’s tectonic movements. Its vision is limited to material reality, replacing the “former hopes of heavenly delight” with a happiness and joy to be inevitably attained “in this world only.” The titular cataclysm is the ascendancy of the Übermensch who rules by virtue of his greater advancement. Once this happens, Ivan claims, “the entire old world view will fall of itself…and, above all, the entire former morality, and everything will be new.” Ivan’s prophecy echoes another, predicting the one who will “make all things new” (Rev 21:5), but his phylum of nameless man-gods is the antithesis of the particular, singular, God-man. ‘Do you see these stones in this bare, scorching desert? Turn them into bread, and mankind will run after you like sheep, grateful and obedient, though eternally trembling.’ But…what sort of freedom is it, you reasoned, if obedience is bought with loaves of bread? You objected that man does not live by bread alone, but do you know that in the name of this very earthly bread, the spirit of the earth will rise against you, and…mankind will proclaim with the mouth of its wisdom and science that there is no crime, and therefore no sin, but only hungry men? The Inquisitor is a deeply – albeit twistedly – humane governor, satisfying humanity’s material needs in exchange for their freedom and nobly taking on the awful responsibility of decision-maker for his entire species. In his view, Jesus of Nazareth did the worst, most dangerous thing he could have done in freeing humanity from a strictly predetermined existence. The absence of human responsibility within the Inquisitor’s deterministic framework justifies all like him who, controlling the masses by controlling their environments, promise the end of suffering. 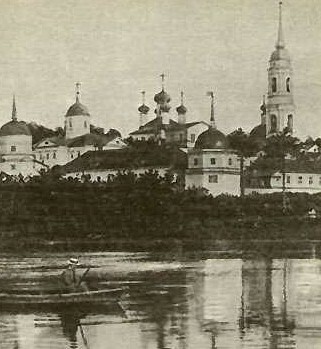 The monastery of Optina Pustyn, where Dostoevsky was a frequent visitor. Alyosha’s is a different story. At the novel’s opening, he has left his studies and entered the monastery of his spiritual father, the renowned Elder Zosima. 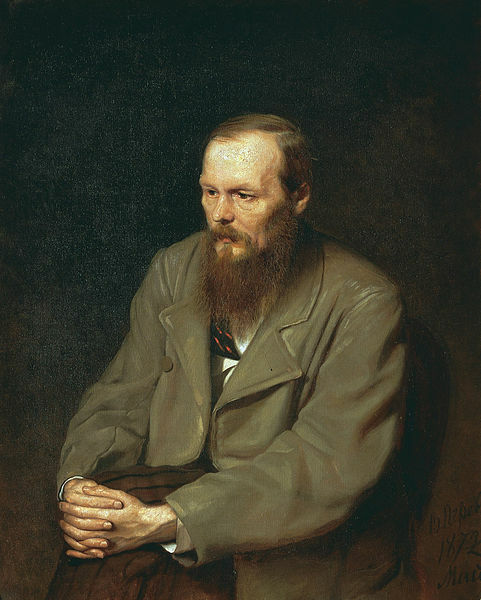 Dostoevsky writes an extended portrait of Alyosha’s faith and its historical vision in his chapters on the death and subsequent rapid putrefaction of Zosima. The shocked town speculates, unimaginatively, on what hidden sin caused such an apparently holy man to begin stinking so quickly. Grieved by this and by his tense discussion with Ivan the previous afternoon, Alyosha is leaving the funeral when another priest calls to him, able to discern a great shift in his heart but not its direction: “Can it be that you, too, are with those of little faith?” Alyosha grins eerily and walks away, but the narrator answers for him: “No, he was not with those of little faith. It was even quite the opposite: all his dismay arose precisely because his faith was so great.” Alyosha’s grief is not brought on by the disappointed expectation of a particular miracle, but by his disappointed hope of vindication for Zosima, who “was to have been exalted higher than anyone in the whole world.” Nonetheless, “that this most righteous of righteous men should be given over to…jeering from a crowd so…far beneath him” deeply wounds the young man who has come to love the interruptions of mercy in a rational, predictable universe. Soon, encountering Ivan’s associate Rakitin, Alyosha accepts sausage and vodka – prohibited by his fast – and accompanies him to a disreputable woman’s house. By all appearances, and despite the narrator’s assurances, Alyosha is following the route laid out by his brother. Yet by the end of the novel, Ivan has realized where that route leads: to a society in which, in the final sense, there is no such thing as evil or the free will to commit it; there are only asocial actions caused by poor circumstances. The murder of Ivan and Alyosha’s father, as described by one woman, was environmentally conditioned, and the murderer can therefore not be held responsible: “he was beside himself when he did it, or rather, he was within himself, but didn’t know what was happening to him…let them forgive him; it’s so humane.” Madame Khokhlakov attempts to dissociate “him” from “himself,” saying both that “he did it” and that it “was happening to him.” She speaks of humane forgiveness, while truly calling for the bald denial that any moral wrong took place. Ivan suffers, though, as privy to the only confession of the actual murderer, who depicts himself as motivated by Ivan’s own progressive rhetoric. This crucial revelation is chilling, wracking him with guilt, and he is only further tormented when – cruelly echoing his treatment of Alyosha in Book V – Satan appears to him to taunt him with a recitation of “The Geological Cataclysm.” This marks the beginning of his breakdown, and afterward he both desires and despises the ability to explain it all away as a hallucination, finding himself in the catch-22 of the teachers and the doctors: forced to sacrifice either health or humanity. Such a barren moral landscape is the inevitable result of the deterministic model of history. When Ivan finally reaches the land he has longed for, he cannot endure it. Its tales were empty, and he can only weep and collapse. Meanwhile, though he has not returned to the monastery, Alyosha has nevertheless resisted the allure of amoral determinism. At the woman Agrafena’s house, as she banters with Rakitin, laughing at Alyosha and sitting on his lap, the narrator tells us that “what was happening in him was not what might have been expected…he was now wearing the strongest armor against any seduction and temptation.” It is not prurience that she arouses in him, but the pure curious love of which prurience is a perversion. When Rakitin reveals that Zosima is dead and snickers at Alyosha’s apparent apostasy, Agrafena leaps up, embarrassed at her flirting and genuinely concerned for Alyosha. After giving her “a long, surprised look,” he exclaims, “Rakitin, don’t taunt me with having rebelled against my God…I’ve lost such a treasure as you never had, and you cannot judge me now. You’d do better to look here, at her: did you see how she spared me?…I’m speaking of you, Agrafena Alexandrovna. You restored my soul just now.” In this moment, the two realize that they have deep, fraternal love for each other; Alyosha even calls her “a true sister.” It is a stunning reversal, and it forges a strong new friendship between the novice and the courtesan. Zosima’s unexpected disgrace has defied his expectations, but Alyosha has to realize that God was not being unjust but merciful. What was disgrace for Zosima’s legacy becomes a grace for Alyosha, teaching him to suffer another’s shame and so become conformed to the likeness of Jesus Christ. Mercy is a discontinuity in the linear function of history, confounding even the most sophisticated expectations. It is a lesson Zosima would have particularly liked. With this, Dostoevsky gives us a Christian view of history standing as a decided counterpoint to the progressive narrative. People are not isolated units to be considered in the calculation of some aggregate good, but relational parts of a whole designed to love in freedom. We do this with our trust, not in the inevitability of an increasingly painless life, but in a person whose promise will be fulfilled at a time and in a way we do not expect. Where our cultural scripts tell us that our salvation is in knowledge-powered prediction, Ivan would remind us that this creed has terrible costs. Yet, lest we despair with him of finding any meaning, Alyosha testifies that beyond the confusion there is hope and an ultimate purpose. Together they point us to the story beyond the stories, the one most worthy of man and most worth telling and living. Samuel McClelland is a teacher in Phoenix, Arizona. The use of Nietzsche’s term here is slightly anachronistic, but nevertheless appropriate. The German introduced the term “Übermensch” in Thus Spake Zarathustra in 1883. Dostoevsky had finished The Brothers Karamazov in November 1880, and died four months later, too soon to see his prescient commentary validated. Traditional piety, inspired by the Biblical promise “you will not let your holy one see corruption” (Ps. 16:10; Acts 2:27, 13:35), expected the bodies of the truly saintly not to rot – and sometimes even to exude an aroma of roses or incense instead. To this day in the Catholic and Orthodox Churches, an incorrupt corpse is evidence in favor of, though not a prerequisite for, canonization or glorification.